We ditch the gym and work out at home – but does it stack up? I'm more than halfway through the Fitbit fitness challenge now and the Fitbit Ionic is proving to be the perfect companion for all kinds of workouts, whether that's running, yoga, spinning or so much more. I'm Becca Caddy and I've been embarking on a challenge to do more than just track steps with my Fitbit. I've been breaking new ground for myself with running and spinning classes, and also started to work on more familiar exercises such as yoga. But a lot of people don't have the time to squeeze in a fitness class, the motivation to make it to the gym or the enthusiasm to pound the pavement (especially now the temperature's dropping and the evenings are darker than ever). So how do we keep up the fitness momentum when our free time is non-existent and our drive to work out is dwindling? One answer is to work out at home. Don't worry, we're not going to recommend super cheesy aerobic programmes endorsed by a Z-lister or gimmicky shaking weights routines. Instead, the Fitbit Ionic is packed full of preloaded workouts that'll show you how to keep fit whether you're at the gym, down the park or just in your front room with 10 minutes free before you need to get ready for work, get the kids set for school or get stuck into that big deadline. The workouts the Fitbit Ionic serves up are known as Fitbit Coach; turning your Ionic into a personal trainer on your wrist, but without the shouting and expensive fees. 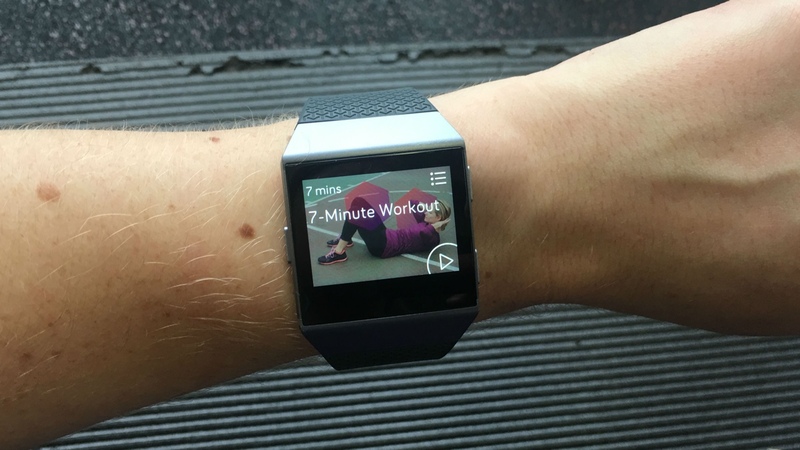 To access the Fitbit Coach workouts, open up the Ionic menu screen. From there you'll find an option called Coach. Click on that and you're presented with three different workouts on your wrist: there's 10 Minute Abs, 7 Minute Workout and Treasure Chest, which is 20 minutes long. Fitbit will also add more workouts over time, and have already opened up their Fitbit Coach programme. Each option provides you with an instant workout wherever you are. But the best bit is that the Fitbit Ionic acts as a guide, providing you with detailed video walkthroughs that show you exactly what the moves look like, along with timers, commands and the option to pause at any point if you need a quick breather – you might need a few if you're not used to side-planks. Ouch. Before I got stuck into the Fitbit Coach workouts, I wanted to check in with former Olympian and Fitbit ambassador Greg Whyte to find out what he thinks of this flexible brand of on-wrist workouts. "It's great!" said Greg. "Having such detailed guidance close at hand means you can complete a session anytime, anywhere." As Greg told me earlier on in the challenge, keeping fit is sometimes about pushing harder and reaching peak performance. But the key is often setting goals and consistency. After all, there's no point pushing yourself to the max, injuring or exhausting yourself and then not working out for another month. It's common, and it's not going to lead to long-term fitness. Keen to get started with the Fitbit's workout plan, I asked Greg whether such such short blasts of fitness really need any prep. Can I skip the warm-up routine in favour of a bit more workout time? "Warm up, including stretching, should be part of every workout," said Greg. But he agreed that sometimes it's just not possible with time constraints. "The general rule of thumb is: the higher the intensity of the session (the harder the session) the more important a warm-up is," said Greg. "In other words, if you haven't got time for a warm-up, select a low intensity workout." I wanted to take all of the Fitbit Coach workouts for a spin, so I started with the 7 Minute Workout. If you've not heard of the 7 Minute Workout before, it's based on a popular scientific theory which suggests that using High Intensity Interval Training (or HIIT) targeting major muscle groups over the course of seven minutes might be just as beneficial as longer training sessions. I was familiar with the moves, but it was great that the Ionic sorted out the timings for me, and gave me a refresher about how some of the moves looked when I was getting tired and couldn't remember! The best bit is it gently vibrates when you need to have a rest or move to a different pose. This takes all the stress away from thinking about what comes next and means you can focus on the workout – not forgetting the routine. As you can see from the heart rate graph, I stayed in Fitbit's Fat Burn zone and my heart rate fluctuated as I moved in and out of certain moves. I took a little 10 second pause halfway through to regain my breath and composure, which you can also see from the chart. Next up was 10 Minute Abs, which used a series of different exercises and poses to focus on building up core strength and stability. I'd got really warmed up by this point and found some of the poses particularly challenging, which is why my heart rate jumped up into the Cardio zone from the Fat Burn zone. This made me feel great about the workout, I was toning up my abs while also getting a good cardio workout. Finally I tried Treasure Chest, which was a big mixture of lots of poses and exercises from the 7 Minute Workout and 10 Minute Abs combined. I took this slowly and didn't do as many reps as I should have to make sure I didn't push myself too much. As you can see I moved between the Fat Burn and Cardio zones and kept up a pretty steady heart rate throughout. You also get a full and immediate feedback on the Ionic, with a summary of key stats on the screen at the end of each workout – so you can immediately see heart rate peaks and average for the session – plus the all-important number of calories you shredded. One of the things I noticed when I started the Fitbit Coach session was that I had to rely on the Ionic to keep me motivated. At first this was easy; it vibrated when I needed to move, which was a lot nicer than being in a boot camp session and being shouted at. But I felt I needed a little bit more motivation, so I listened to some of my favourite motivational tracks that I'd already added to my Ionic and paired up with my Bluetooth headphones. This is a really great thing about the Ionic – you don't need your phone at hand to listen to music to keep you going. You just need to make sure you set up your Personal Music from your Fitbit dashboard on a laptop or computer, then you can listen to music with just your Ionic to power you through. Once I was done I felt tired and satisfied with my efforts. Even after the first session it felt like I gave every part of my body a good workout. So this made me wonder – do I really need to run, go to yoga and put myself through a serious spinning session when I could just work out for seven minutes each day instead? I asked Greg how often we should really be switching spinning for at-home workouts. "The Fitbit Coach workouts are great if you're short on time or short on ideas. They're not a substitute for longer sessions all the time, but they are a solid addition to your programme," said Greg. "One of the reasons I recommend them is they're great for targeting specific areas, like for core strength and stability use the 10 Minute Abs Workout." Next week I'm going to be getting to grips with Crossfit, the super intense workout tracked with the Fitbit Ionic, and hitting the pool to see how the Ionic can help me become a better swimmer.